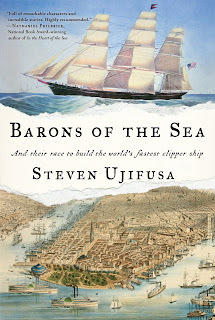 Q&A with Steven Ujifusa: Author of "Barons of the Sea" ~ The History Girl! 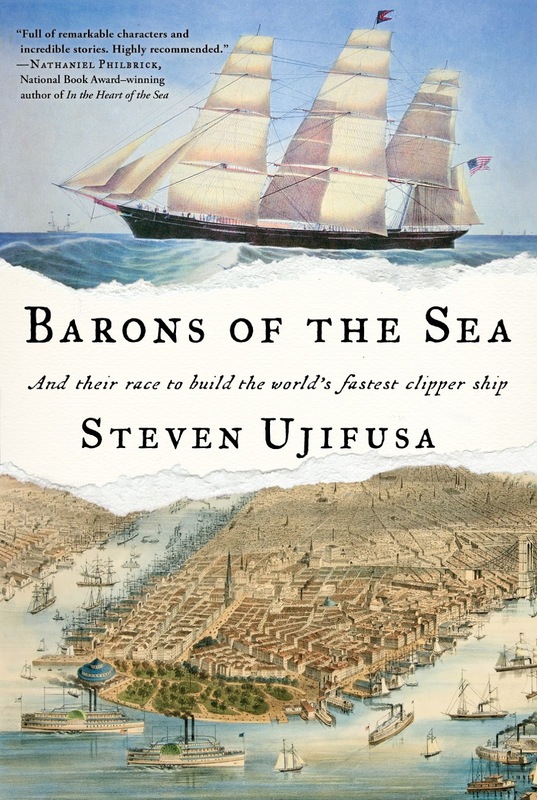 Q&A with Steven Ujifusa: Author of "Barons of the Sea"
1. Your book starts in 1837, with a young Warren Delano at the center. 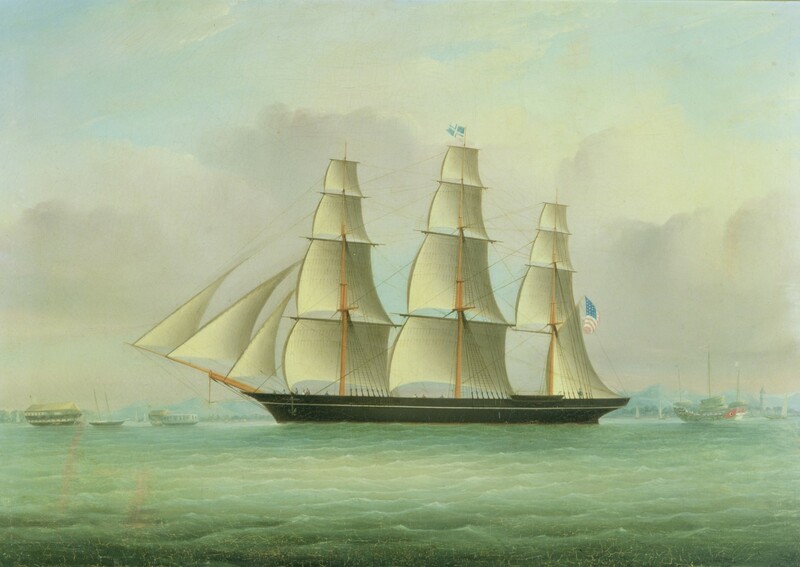 What was the state of American clipper ships and trade with the Chinese at that point, before ‘the race to build the world’s fastest clipper ship’ began? Before the First Opium War (1839-1842), Western merchants were only allowed to do business in the city of Canton (modern-day Guangzhou). The Chinese government, fearful of foreign influence, tightly regulated all aspects of the tea trade. 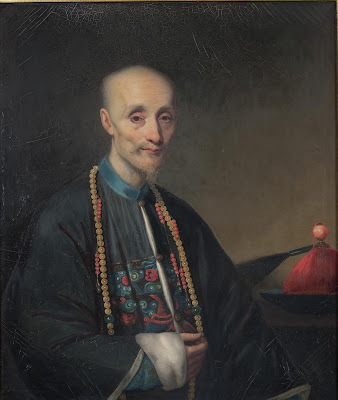 To grease the wheels of the Chinese bureaucracy, Western merchants used a complex code of bribes and “pidgin” expressions, especially when smuggling opium into China to pay for the tea. The First Opium War changed the rules of the tea trade, at the expense and humiliation of the Chinese government. 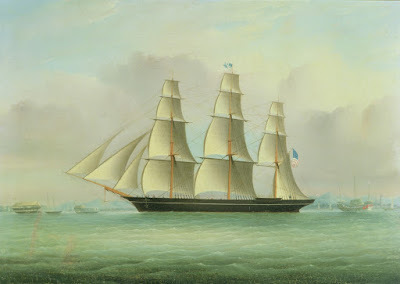 Shortly before he sailed back to America after a decade in China, Warren wrote home about the need for a new type of vessel that would be able to carry large quantities of tea home, “and fast.” He and other capitalists would invest considerable funds to build sharp, heavily-sparred vessels (with many design-cues from the “opium clippers”) that would out-sail the slow, kettle-bottomed British “East India” packet ships. 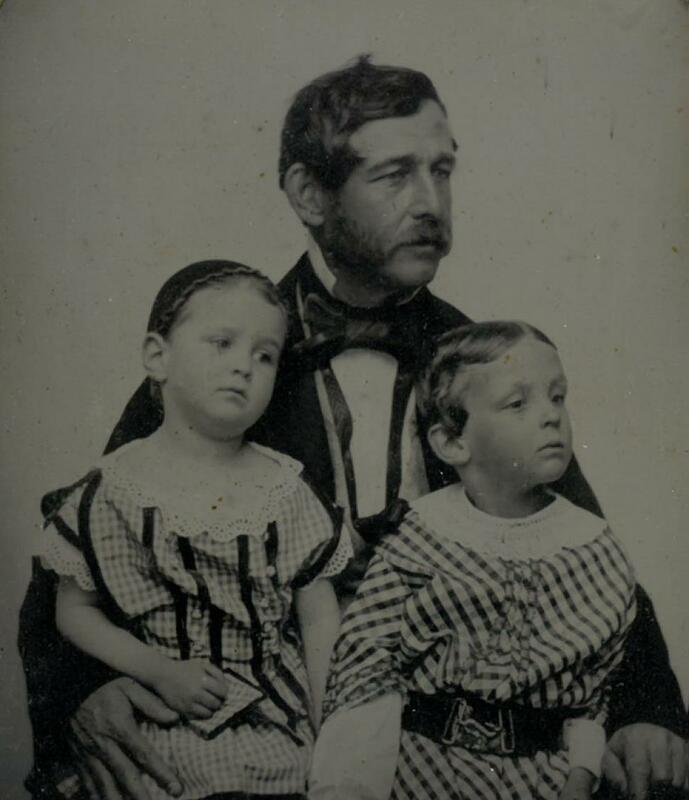 Warren Delano with two of his children, Warren III and Sara. Sara would later become Franklin Delano Roosevelt's mother. Sara Delano Perkins Collection. 2. What are some famous names in Barons of the Sea that you think readers will be surprised to come across, or that surprised you in your research? 3. Why did men decide to join the Chinese tea and opium trade – which seems perilous and required years of separation from their families – what was the appeal? What was life like for the American men who made the trek? What was it like for their families? Going to China and becoming partner at one of the big China trading firms was one of the quickest ways for a young American to get rich in the early 19th century. It was a bit like moving to Silicon Valley to strike it rich in today’s tech start-up world, only with a much greater chance of dying! Many young men, mostly from New England, dreamed of securing the connections to spend a decade or so in China and come home with a “competence” of at least $100,000, which in those days was enough to make one independently wealthy. Yet it was also a journey fraught with risk. One scion of a clipper ship family died by suicide after being turned down for a company partnership for the third time. Generations of Boston children recited the old lament: “Dear papa done Tanton [gone Canton].” In some cases, wives and children sailed to China and settled on the island of Macao, 80 miles downriver from Canton. 4. Who (and later, what) was Houqua? Houqua was leader of the Co-Hong, the guild of Chinese merchants in Canton. These dozen or so men were the only people allowed to trade with Westerners, known colloquially by the Chinese as fanqui (“foreign devils”). 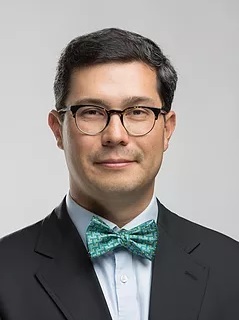 His actual Chinese name was Wu Binjian, but to his American friends he was known by the Western “business” version of his name. His control of the Chinese side of the tea business made of the richest men in the world during the 19th century, with a fortune of approximately $8 billion in today’s money. He was the godfather of an official fraternity of American men who revered him, his business smarts, and his memory after he died in 1843. One of American protégés named one of the first clipper ships in his honor. His name lives on today in Hu-Kwa tea, a smoky blend that still is a favorite of the descendants of the Yankee China traders. Houqua. By permissions of Frederic Delano Grant, Jr.
5. What were the most pressing technological challenges faced by the traders and their ships? What is particularly noteworthy about their design and set them apart? With no extraneous ornaments except a figurehead, a bit of carving and a few lines of gold leaf, their one purpose of speed over the great ocean routes was achieved by perfect balance of spars and sails to the curving lines of the smooth black hull; and this harmony of mass, form and color was practiced to the music of dancing waves and of brave winds whistling in the rigging. Clipper ships were the culmination of decades of experimentation on the part of American merchants and shipbuilders. In the early 19th century, the American government placed virtually no regulations on ship design and operation, so profit maximization was the principal design consideration. By the mid-1840s, American clippers had cut the sailing time between China and New York almost in half. American customers got their tea faster and were willing to pay a high price for the season’s first pickings. High value freight more than made up for the extra crew cost and reduced cargo capacity. When gold was discovered in California in 1848, the clipper ship business became a round-the-world enterprise, in which ship-owners deployed even larger, faster vessels to sail around Cape Horn to San Francisco, and then across the Pacific to China. These California clippers became legends, such as Flying Cloud, Young America, and Sovereign of the Seas. By cutting the speed of the global supply chain essentially in half, American clipper ships revolutionized trade in the 19th century in the same way Amazon has in our time. When it came to the clipper ship business, the Americans and the British were fierce rivals. The British had long operated their tea business under a state-sanctioned monopoly, and speed was not a concern at all for the ships of the British East India Company. When the first American tea clipper sailed into London in 1849, beating all British ships to market, the London Times declared: “We must run a race with our gigantic and unshackled rival.” Soon, the British were building their own clipper ships for the China trade, the most famous of which is Cutty Sark (namesake of the famous whisky) preserved today in dry dock in Greenwich, England. She is the only extreme clipper, British or American, to have survived intact. 6. What first drew you to the world of Barons of the Sea and inspired you to write about it? The ships are long gone, but their romantic, intrepid allure lives on to this day, in paintings, stories, and song. My hope in Barons of the Sea is to bring the clipper ship era to full and vivid life. It’s a historical canvas populated not just by arguably the most beautiful ships ever to sail the seas, but also by a cast of colorful, ambitious, and flawed characters. For me, the draw was the challenge of writing a book that was not just about ships, but about families. Barons of the Sea also is about a quest to build a transcendently beautiful type of vessel, the American clipper ship, but it is also the story of dynastic ambition. The clipper ships were not the end goal, but the means to a goal: American dominance of global trade and great wealth for the owners. The men and women in Barons of the Sea were talented and driven in so many different areas (shipbuilding, navigation, and trade), but they were all intensely loyal and ambitious for their families.